I wish it was that exciting but sadly it really really isn’t. Both my parents come from the deep south of Victoria and I am the youngest of five children… so I have seen and experienced things that no one should ever witness. I guess you could say I’m as Australian as the Kerrigan family, I just love the serenity. It wasn’t until Dragon Ball Z and Pokemon infiltrated our all-Aussie home that I was introduced to Japanese culture, but that was soon to be just the beginning to this lil boy’s cultural journey. I think this was the first black and white film, and first subtitled film I have ever watched from start to finish. Being a 21-year-old Australian, I tend to only watch films and television shows that originate in the US and Australia; sometimes ones from the UK sneak their way into the mix. Being exposed to a film that is as culturally diverse as Gojira, and as far from my comfort zone as can be, really opened my eyes. While watching the film, I tweeted “what a cinematic masterpiece”… I’m not going to lie when I say I was being a little sarcastic at first but as the film went on and we were exposed to the film maker’s use of model work and post-film productions, such as the siren that alerted the city of Godzilla’s appearance, I really did start to believe that the film was kind of a cinematic masterpiece. Scenes like Godzilla destroying the obviously teeny-tiny train made me chuckle but still had me intrigued with the methods film makers had to use in times where technology was limited. Audiences from this time period probably found Gojira extremely dramatic, where a lot of us watching it in the tutorial found it quite funny. I thought I was going to struggle to pay attention throughout the film as it was subtitled and I have a very short attention span – I think I have YouTube videos to thank for that now. I still remember sitting in my Year 9 Japanese class and not having any interest in the Japanese soap opera we occasionally watched. This, in turn, had me thinking that I wouldn’t have any interest in keeping up with what was happening and being said throughout Gojira but I found that even if I looked away from the screen for a period of time, I was still able to keep up. Most of this was due to the emotive acting and the loud sounds and near silence used throughout. I’m still quite amazed at how captivating the scenes that were entirely silent were. The overly staged and highly dramatic acting contributed to the viewing experience as it meant that I didn’t always have to rely on the English subtitles to understand what was happening in the scenes. As someone who was never seen anything Godzilla related, I was completely ignorant Gojira‘s significant representations of historical and socio-political events. After the post film discussion in the tutorial and reading through both classes live tweets, it became blindingly obvious what Gojira, as a film and figure, stood for and represented at a time where Japan was struggling with who they were as a nation. When I first realised I would have to do this subject on Digital Asia, I must admit I was wary and disappointed. I am not really one to watch anime, or read manga, or really I’ve never been interested in it at all. I was again surprised that the first movie we were to watch would be Godzilla. I’ve never watch the original, although I have watched the latest one (Gareth Edwards, 2014), and the one where the bad hair over took the story line (Roland Emmerich, 1998). This subject is heavy on the autoethonography methodology, and it is necessary for me to relate back to the subject matter in a way that explores my own connection and contextual understanding of it. My cultural background is limited, at best. I have no real understanding of Asian media, other than the cartoons dubbed for Cheese TV back in the ’90s-00’s. The way I have watched, understood and disassemble the movie Gojira from 1954 is through the discussion in class about the contextual and historical location Godzilla has in the film world. I never really put much thought into the big lizard, and through the discussions over twitter and in class I have learnt a lot more about where it stands as a movie. The movie came out at a time where Japan had lost its sense of self; the Japanese culture had lost a part of its identity due to the clashes with the West. Not so subtle inferences to Hiroshima and Nagasaki and the fall out of nuclear war are echoed throughout this movie. Godzilla himself, with his nuclear breath, is the metaphor for a time where the possibility of being wiped off the map, was a reality some thought would happen. The sentiment of antiwar and anti-nuclear weapons was a powerful message to be sending out in a post-war Japan. 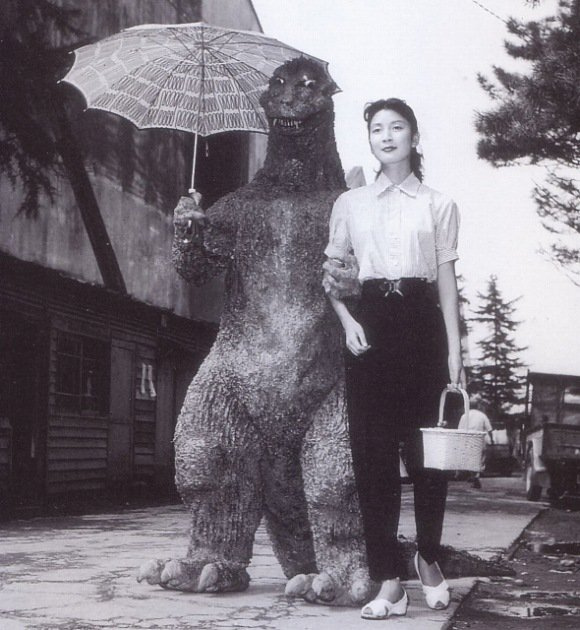 Godzilla was symbol and exploration of the people’s fears, encased in a rubber suit. To my understanding, Godzilla was a call for the end of this type of destruction. Godzilla speaks louder than roars, as even in modern times, the monster can be the symbol for whichever man-made disaster is occurring at the time. Global Warming, war, nuclear power – all of these topics are easily interchangeable as a new Gojira. My understanding of the context and importance this film has all stems from discussions in class and a larger memory of history than I thought I had. The subject matter is much richer than just a monster in a rubber suit. It is a movie that speaks up about what an entire country felt at the time and that is powerful.